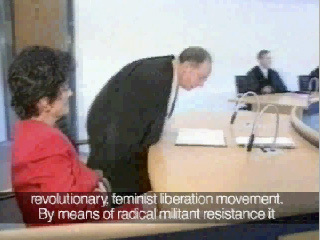 Rote Zora is a militant women's group that carried out over twenty attacks and various other offences in Germany in the eighties. They fought against atomic, gene and reproduction technologies; the corresponding targets of their attacks were companies such as Bayer, Schering and Siemens, research institutes and property of the "representatives of the patriarchal order" (RZ 1983). 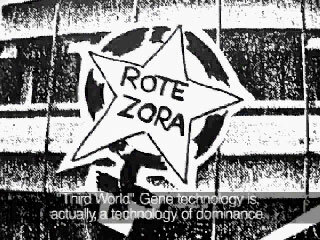 Rote Zora formed a radical political opposition to the existing power which they carried out through a politics of property damage. It was their principle to avoid injuring anyone. Numerous texts and letters claiming responsibility from Rote Zora show that they were an "armed group who, however, battled often enough with the typewriter" (Oliver Tolmein). Whereas some persecuted the women as "terrorists" and continue to do so today, others consider them undoubtedly heroines. The central element of the video "Die Rote Zora" is an interview with Corinna Kawaters that took place in summer 2000. 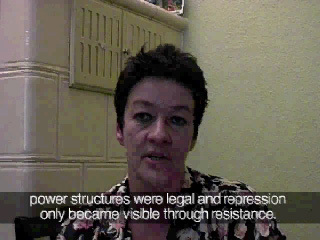 Kawaters is the only woman from the Rote Zora who was sentenced by a court for "membership in a terrorist organization" (§129a). 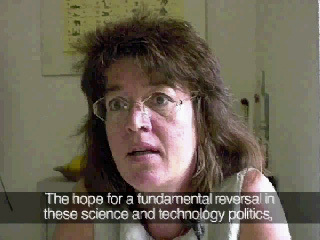 In addition, a conversation was held with the social scientist Erika Feyerabend, who, like the other members of the Gen-Archiv Essen, became caught in the whirl of police investigations against the Rota Zora at the end of the 1980s.